The Strawberry Festival is a great for kids and families. Vashon Theatre is hosting the FREE RANGE FUN ZONE in their parking lot. There will be activities for all ages that include climbing, spinning, swinging, going upside down, and bouncing. 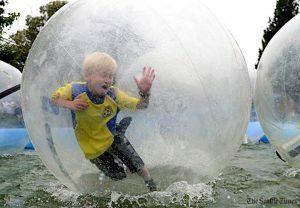 Also located throghout Festival will be Zorb Balls on Water, a Climbing Wall, and Bungee Trampolines. A free Kiddie Train will take kids on a tour of Festival as well. FREE RANGE FUN ZONE! at the Vashon Theatre. The Free Range Fun Zone follows in the great Vashon Tradition of having a space for kids to run free and play. 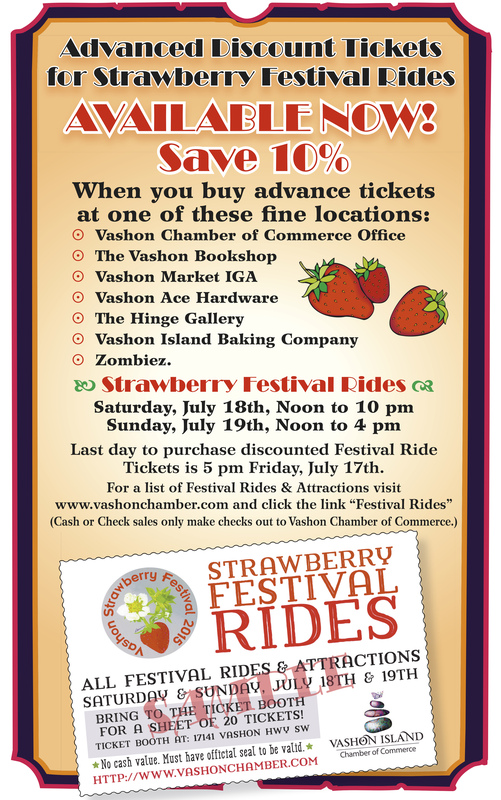 Contained within the Vashon Theatre Parking Lot the FRFZ will feature bounce houses and rides. There is no confusing ticket sales for the Kids Zone, just purchase a Kids Zone Bracelet at Vashon Theater for unlimited use of the attractions in the Theater Parking Lot and they get an day movie pass. There will also be a beer garden for parents to sit in while the little ones play their hearts out! Come in like a wrecking ball! Take a Wild Ride on this Spinning,Swinging Wrecking Ball. Seating up to 10, this Ride Rocks and Rolls and is guaranteed to give you a thrill. Guess what song we will be playing when you are on this ride. Inflatable Bouncy Houses and Slides! Jump up, jump up, and get down, jump around! 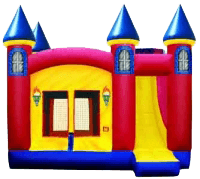 Bouncy house, Jelly Castle, Moon Walk, whatever you call them, we will have them so you can bounce yourself silly! The Pirate Swing will test your sea legs! See if your a land lubber or a salty dog! Spin on the Gyration Space Simulator! Find three friends and go for a wild ride on the Gyrotron Space Simulator. Strap in and get ready to go up, down, and all around! Click here for video of the ride. Venture out of the Free Range Fun Zone and you will find several other thrilling attractions spread throughout Strawberry Festival! Prices vary and are posted on each attraction (not part of unlimited rides wristband). Festival Favorites Bubble Fun is back with the Water Balls are giant inflatable balls, much like hamster balls, that you get in and roll around on a pool of water! Way too much fun. Click here to see videos! Jump! With the Euro Bungy! The Euro-Bungy flings you 25 feet into the air off of inflated trampolines. This extreme air power jump truly gives you the sensation of being weightless. It's 100% safe and 200% fun. Experience the adrenaline rush of a bungee jump as you perform gravity-defying moves. Click for Video. The return of the big daddy of rock climbing walls! 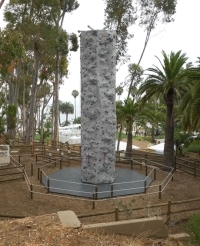 Perfect for groups with different ages and abilities, there are four climbing areas that vary in difficulty and equipped with safety harnesses. Climb to the top for a terrific view of Strawberry Festival! All aboard! Join the traditional Strawberry Festival Kiddie Train is always a hit and free to ride. The Kiddie Train Station will be at the North End of Festival outside of Ober Park.